I started this list for something else and thought it might be helpful if I posted it here. I'm cheap and have access to various junk and stuff and things. I also grow a lot of tomato plants in a handful of different size/shape plots. Support methods depend on material available, plot size, number of plants per plot, and how big and productive I want a given plant to be. Sometimes its better for me to grow three plants, each pruned and staked, in the same space that would fit one unpruned caged plant. The question of "which is best?" depends on the circumstance. I included the spacing I use or would use. Last edited by TZ -OH6 on Mon Jun 28, 2010 12:23 am, edited 1 time in total. Wow, TZ, this is GREAT! Your list is giving me all kinds of ideas! Thanks TZ now I don't have to do it. I saw this topic but not the poster and thought here's yet another question on support. I was thinking I should make up such a list and ask that it become a sticky. I see this question so often so what do you mods think. STICKY THIS! Only thing that would make this better is links to sites or just some picture of your own support methods. Last edited by gixxerific on Wed May 12, 2010 6:59 pm, edited 1 time in total. I wish this forum had direct download for pictures. I do have some great pictures but I don't have an image account and don't plan on getting one. I'm on dail-up and can't even see most of the pictures other people post here because of download times from places like Imageshack. TPTB can sticky this and retitle it if they like. I already put in the request. Waiting for WM's approval. Great recap TZ. I resemble many of those methods. The idea to have 1.5 height on construction wire is a good idea. Healthy tomato plants always outgrow five feet and head back down. 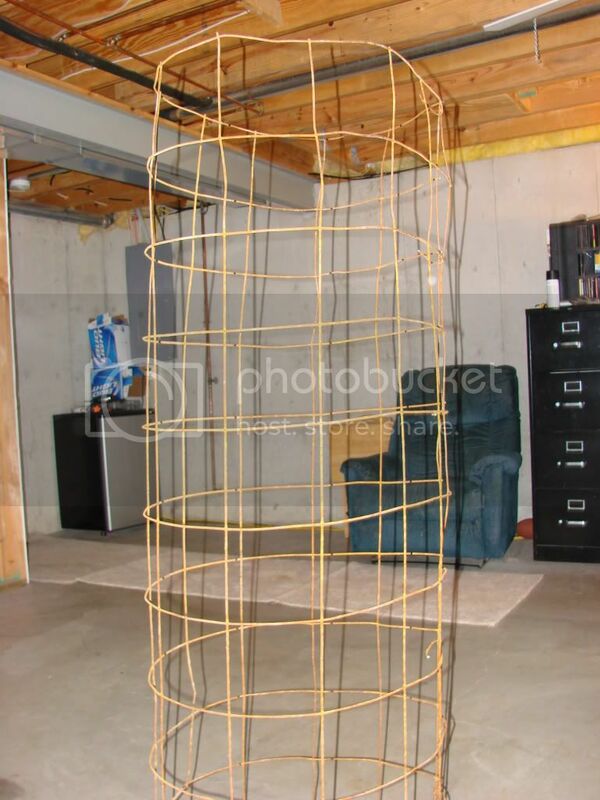 I bought some 6ft metal spirals for my Black Cherry, Sungold Cherry, and Nicholayen cherry plants. Nice i hope? Here is an example of staking from last year. Great ideas - everyone should be to find an appropriate method for their own needs. I use 4' high stock fencing - a $50 roll is plenty for a dozen or more long-lasting cages. The wire is relatively easy to cut and work with; once the cages are assembled, I cut "access windows" into the sides as the plants grow to make weeding and harvesting quick and easy. Rather than trying to find space to store the cages from year to year, I lay them on their sides in the garden as part of my fall/winter cat-proofing system. I've always used the CRW cages in the past. They work great. This year I started a lot of heirloom tomatoes and simply didn't have enough cages so I drove three of the T stake fence posts into the soil in an 8' X 4' bed. I then ran cheap nylon rope between the posts creating a lattice effect. This photo was taken a couple of weeks ago. 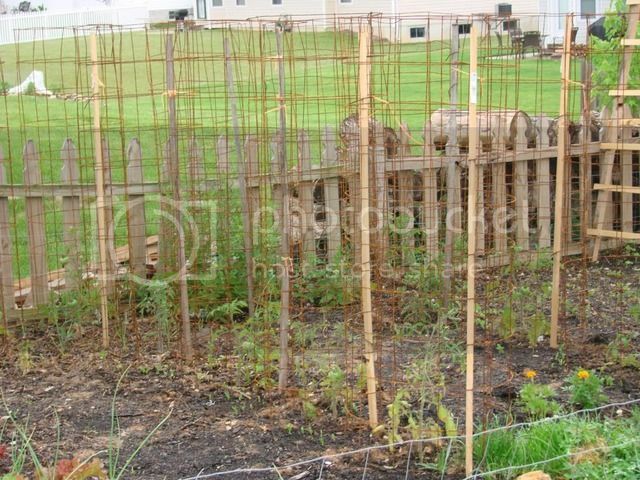 The posts and string in the back have my Prudens Purple tomatoes which have grown significantly since the photo was taken. As the plants grew, I have woven the plants into the rope. The posts and string in front now have three new varieties planted which I will weave into that string as they grow. I don't know if this is the Florida weave or not, but it seems to be working well. At the end of the season, I will roll the string up, pull the posts; and store them for next years garden. tedln wrote: The posts and string in front now have three new varieties planted which I will weave into that string as they grow. Ted, we gets lots of wind where I live, and I am sure others do also (As a matter of fact, it seems to be much more windy in the last 5-8 years than ever before, or maybe I am just noticing my tomatoes getting blown over). Back to the point, I think my tomatoes would get "cut" by the string. I like the weave idea, though. When I was growing up we had some super duper fence sections, shaped like net wire, but the wire was huge. The section would stand up on its on, was strong enough to actually be a gate, and the opens were probably 4 inch by 4 inch. The section was probably six or eight feet long. I have thought of using one of those, if I can find some at the farm----put two metal posts in the ground, and tied the section to them. I think my parents might have run cucumbers on them. Anyway, the wire is large enough that it could well support the weave idea. I sorta have my cukes running on something similar now. It is construction wire, left flat, and attached to metal posts. I might try some tomatoes like that. You may be 100% correct. We do have high winds. Had a couple of days of 55 mph winds a few weeks ago. It was snapping my squash plant stems off at ground level and the plant would blow away. 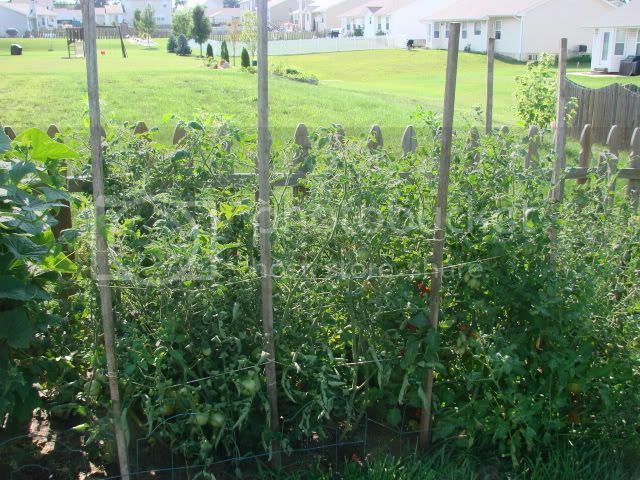 I did consider the wind problem when I installed the rope/post support for my tomatoes. I decided the Prudens Purple tomato plants are large and when woven into the rope will provide a degree of tension to the ropes which will prevent the plants from moving against the ropes in a sawing motion. I may learn this year that the system is not a good idea for next year. I guess the Florida weave is something I need to research a little. My desire was to have something the tomatoes could grow onto or into, rather than something to install after the tomatoes are of good size. I looked at the Florida Weave support system and it is different than mine in that the string/rope is on both sides of the tomato stem at each level. The only problem that presents for me is the fact that you must continue weaving the support as the plants grow. Seems pretty labor intensive to me. While the Florida Weave does provide more support, it also requires more effort than I want to expend. Since tomato plants don't always grow up in a straight line, it may be difficult to weave the support line into the tomato stems without a lot of effort. I did a minor revision to my support that is not reflected in the photo. I have a good supply of those tall green, plastic coated; garden stakes you can buy at the big box stores. I wove a few of them at regular intervals from the top rope strand down through each rope strand, and pushed them into the ground. Each stake took about 30 seconds to install. The stakes do tighten the support strands and prevent sideways movement of the tomato plants on the supports. I guess I will know this winter if it worked. 1947jd wrote: Great ideas - everyone should be to find an appropriate method for their own needs. Thats the same material I've always used for my cucumber trellis access holes included. It just never seemed to have the structural strength of the CRW for supporting large tomato plants. re using tomato support after late blight.